Given the extensive musical resumes of Theo Travis and Robert Fripp, it was only a matter of synchronicity that would lead to a real time collaboration by these two innovators. 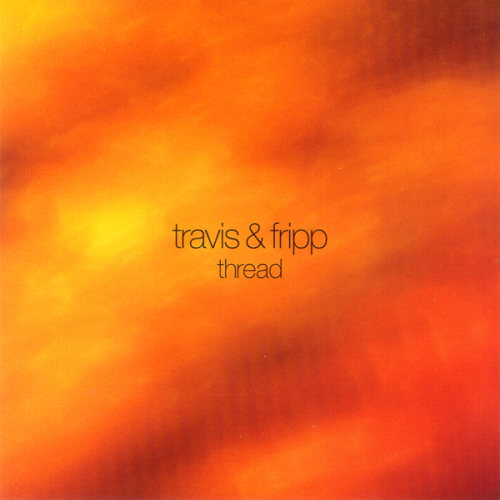 Travis work with Cipher and Fripp's ambient efforts dovetail into this clearly unique audio pastel map of quiet loops and serene themes. Blurring the lines between improvisation and written material is the impetus for the project which shows strong command of musical context. The results are willfully disorienting and spacious with Fripp displaying control interjecting left channel sweeps on pieces such as "The Apparent Chaos of Blue." Other tracks of note include "Before Then," that opens with tenuous digital bell steps and Travis' lean flute offset by unprocessed guitar tones. As the flautist multi-loops himself it creates a hazy sonic web of confusion. "The Silence Beneath" provides Travis' most romantic soprano sax leads, with its slow purposeful, intertwining. Mid-way through the piece Fripp injects some steely knives adding that appropriate bite that consistently characterizes his playing. "As Snow Falls" was recorded in the dead of winter and carries a large white neutral pattern and flow while "The Unspoken" carries an ambitious overblown solo despite the immobilizing blanket of wash. The keen ear of Steven Wilson at the mixing helm is also a key factor in the recording's success. In summary, the recording falls squarely between recent recordings by Cipher and Fripp and Eno's Equatorial Stars.